This is one of those projects that resulted from just trying to use up some odd bits and pieces of leftover dairy products and fruit. Never wanting to waste good ingredients, I took a few small quantities of sour cream, heavy cream, buttermilk and milk and blended them with a little bit of sugar and lemon juice and turned the mixture into an ice cream. The base tasted super delicious on its own, but since I also had a fresh pineapple that was thoroughly ripened, I thought I’d try swirling a bit of pineapple sorbet through it. The outcome is a fantastic combination of flavors and textures. The pineapple sorbet benefits from the creamy tartness of the ice cream, which also contrasts nicely with the acidic sweetness of the fruit. It’s got a great depth of flavor yet is refreshingly light on the palate. The next time you don’t know what to do with an odd lot of half empty dairy containers, try this terrific sunny blend. It's definitely more than the sum of its parts. - I usually let ice cream bases chill overnight. This allows the flavors to co-mingle and ensures that it’s very cold when it comes time to freeze it in the ice cream machine. 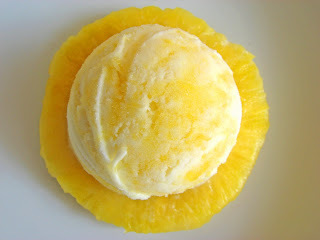 - I made the Pineapple Sorbet first, placed it in the freezer and quickly rinsed out the still frozen bowl of my ice cream machine. Then I spun the Sour Cream Ice Cream mixture. You can also spread this process out over a couple of days. - If you don’t own an ice cream machine, you can still make ice cream. David Lebovitz has a good explanation. 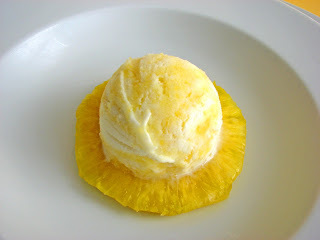 Or even if you do have a machine, you can make the Pineapple Sorbet without a machine so it’s ready to fold into the Sour Cream Ice Cream right away. - Use full fat sour cream. Non-fat products will result in ice cream that is too grainy or icy. Likewise, a certain ratio of sugar is required to keep sorbet from becoming too icy, so the lemon juice helps to balance the sweetness and brighten the flavor. Whisk all the dairy ingredients together until blended. Add the sugar, pinch of salt and the lemon juice. Chill thoroughly. Freeze according to your machine’s instructions. 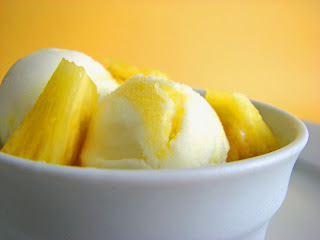 Pour into a clean airtight container and gently fold in the pineapple sorbet for a swirl effect. Put a piece of plastic wrap on the surface, cover and place in your freezer to firm up. Cut the skin off the pineapple and slice about 1 1/4 C of it into chunks, making sure to remove the core. Place in a food processor and puree with the sugar until smooth. Add lemon juice to taste. Chill thoroughly. Freeze according to your machine’s instructions. Put in a clean airtight container, press a piece of plastic wrap onto the surface and place in your freezer to firm up. The combination of the sour cream and sorbet- wow!! This looks beautiful AND delicious. Thanks for the post. My hubby would absolutely love this , he is quite a pineapple fan! Mmm, pineapple! That looks amazing and I'm shivering! Very unique, I can magine the flavor of this ice cream. delicious. What a great sounding ice cream! Thanks so much for all your sweet comments. I am enjoying the introduction to all your blogs as well! Great looking treat! I love the idea of sour ice cream. I have tried rinsing my ice cream canister out before and using it again but haven't had much success...This looks like it's worth a 2 day project, though. Hi, Sara. I have a Cuisinart ice cream maker and I keep the canister in the freezer for a couple days. It gets pretty solid! And the sorbet doesn't need to spin for very long, so it worked out for me. But since the sorbet is such a small quantity, you could probably get away with just putting it in the freezer and whisking it at various intervals as it sets up. 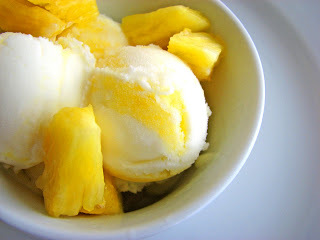 I've got a ripe pineapple on my counter begging to be turned into this ice cream!